Thanks for the kind words dudes! I’m still a little under the weather, but I’m sure I’ll be back in full force in a couple days. Also, thanks again for the feedback I’ve been getting from all of you! Many of you have been asking to hear more about my personal life and my job. Hi! I’d love to hear more about your job. Kink.com must be really interesting to work at! How different is it from your average office? Well, dear reader, I will give you an example. In my office, there is a softpack (NSFW-ish?). This softpack does not get used for it’s intended purpose, but rather for sport. 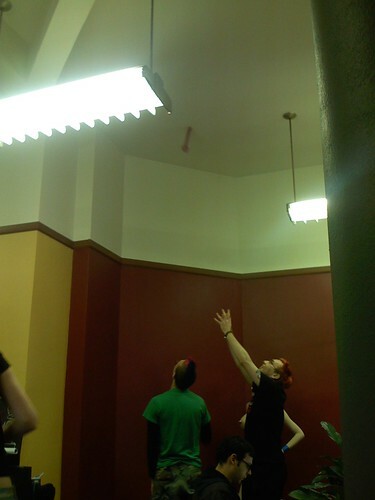 The trick is getting it to stick to the ceiling longer than anyone else. Unfortunately, our poor friend has taken quite a beating from this game, and now resembles a furry animal. & that, my friends, is one reason why my office is different than a ‘regular’ one.